Orlando, FL. 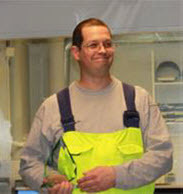 José Quiroz, Operator with Arizona Chemical Company, LLC, Oulu Plant in Finland, was awarded the 2014 Environmental, Health and Safety Employee Excellence on April 16, 2015 by Pine Chemicals Association. The award was accepted by Greg McLean, on Mr. Quiroz’s behalf, at the Spring Meeting that was held at the Villas of Grand Cypress in Orlando, Florida. The Environmental, Health and Safety Employee Excellence award is given to recognize and honor an employee of a member company that has demonstrated excellence in their strong commitment to ensure environmental, health and safety initiatives that are a core value of the organization. Quiroz’s selection was based on a number of factors, including his safety efforts which drove a culture of change within the organization beginning at the grassroots level. “José has continuously volunteered his time to support various projects in the plant, he has updated over 10 operating instructions and has even preformed training in front of his peers during the plants training days,” remarked Eric Wilson, who nominated Quiroz for the award. Quiroz’s consistent and daily emphasis on safety have been the key to improvements at the Oulu facility, including creating the following instructions: Locking procedures (for preparing locking’s prior to maintenance / project works), Shutdown and start-up instructions for the AZC refinery and upgrade plants, Instructions on how to create diagrams in the electronic forms for locking’s / plans for emptying and shutdown of the plant, Training peers on the utilization of the locking plans and providing real-time coaching to his peers during our facility shutdown. “In short – José is passionate and active about improving the work environment and isn’t afraid to share what he knows,” stated Wilson in his nomination. The Pine Chemicals Association congratulates José Quiroz and Arizona Chemical Company, LLC, Oulu Plant, in Finland for their commitment to Environmental, Health and Safety excellence in the workplace and community which they operate. For more information, visit www.pinechemicals.org.